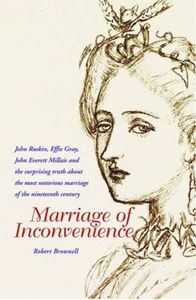 Quick overview Based on original documents never before discussed, this account of the disastrous marriage of Effie Gray and John Ruskin overturns the myths that have grown up around the most notorious annulment of the Victorian period. Effie Gray was an innocent victim of a male-dominated society, repressed and mistreated. Or was she? John Ruskin, the greatest art critic and social reformer of his time, was a callous misogynist and upholder of the patriarchy. Or was he? John Everett Millais, boy genius, rescued the heroine from the tyrannical clutches of the husband who left his wedding unconsummated for six years. Or did he? What really happened in the most scandalous love triangle of the nineteenth century? Was it all about impotence and pubic hair? Or was it about money, power and freedom? If so, whose? And what possibilities were there for these young people caught in a world racked by social, financial and political turmoil? The accepted story of the Ruskin marriage has never lost its fascination. History books, novels, television series, operas and now a star-filled film by Emma Thompson (to be released in 2014) have all followed this standard line. It seems to offer an easy take on the Victorians and how we have moved on. But the story isn't true. In 'Marriage of Inconvenience' Robert Brownell uses extensive documentary evidence - much of it never seen before, and much of it hitherto suppressed - to reveal a story no less fascinating and human, no less illuminating about the Victorians and far more instructive about our own times, than the myths that have grown up about the most notorious marriage of the 19th century.